Hungry?!? Good, because this is one Big Vegan Breakfast blog post! And if you’re reading the title in any other way than to the tune of R. Kelly’s Ignition (Remix), you’re doing it wrong. So read it again, correctly! One of the last meal’s of the day we mastered in our house was breakfast. I’m not sure why – There is just so much more to life than a kale smoothie (my LMS would probably disagree). As a kid I remember looking forward to the weekend – no more pencils, no more books, no more teacher’s dirty looks – at least for two days…And Saturday morning cartoons. I woke up early to start my binge watching and didn’t stop until something for grown ups came on at noon which if I remember correctly was a poor quality local weekend news show. My breakfast of choice then was cereal or Jiffy muffins. Super healthy, right? Now there is nothing quite like a homemade biscuit. Check out this recipe from the Minimalist Baker. These biscuits will make you wonder what you’ve been doing with your life because it was empty before they came! Make a well in the dry ingredients and, using a wooden spoon, stir gently while pour ing in the almond milk mixture 1/4 cup at a time. You may not need all of it. Stir until just slightly combined – it will be sticky. Use a 1-inch thick dough cutter or a similar-shape object with sharp edges (such as a cocktail shaker) and push straight down through the dough, then slightly twist. Repeat and place biscuits on a baking sheet in two rows, making sure they just touch – this will help them rise uniformly. Gently reform the dough and cut out one or two more biscuits – you should have 7-8. I hated bacon as a meat eater…even the smell of it grossed me out…especially first thing in the morning. Then entered tempeh facon. I’ve been making this item the longest. It started as a fix for Lisa’s love of BLTs. The LunchBoxBunch.com‘s recipe is very easy to make – Of course, over time I’ve taken some liberties with the recipe and they have thus far worked out! This is a great recipe that can be altered to the type of tempeh bacon you want. I prefer to have a very strong maple flavor and I’m a heat wimp so I can’t take more than a sprinkle of cayenne. I’ve added my notes in red. Tip: I always double this recipe still using only 1 pack of tempeh. I like the extra flavoring and I don’t feel like I’m stretching the mixture to make it work. Tip: Steam your tempeh before making this recipe. I just take the tempeh out and cut it to fit in my steam basket, then steam for 10 minutes or so – just until it gets soft and looks a little expanded. It cuts some of the bitterness but if you love tempeh you probably didn’t notice anyway. For a more technical approach check out – Vegansaurus! 1. Very thinly slice the tempeh. 3. Combine all ingredients in a shallow dish. 4. Soak tempeh in marinade for 1-2 minutes. 5. Turn saute pan on high, add 1-2 tsp olive oil. 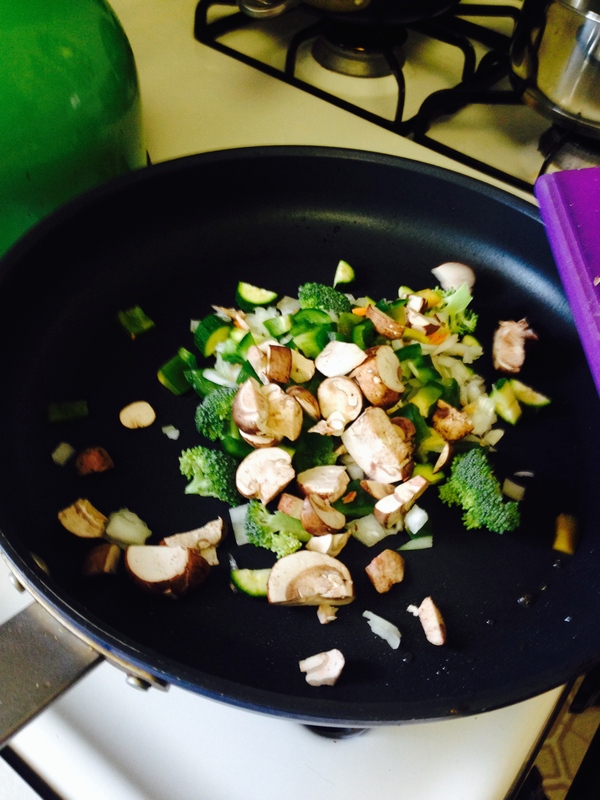 Lay the tempeh flat on skillet. One layer only. Drizzle a bit of excess marinade onto skillet-it should be sizzling a lot now. 6. Allow to cook for 1 minute, then flip. Allow to cook for another minute on other side-or until both sides are crisp and browned. 8. For a crisper tempeh bacon, do not pour excess marinade in skillet, and allow all liquid to steam off of pan while cooking. This is not something I’ve always loved. Growing up I was not fond of grits unless they were loaded with cheddar cheese and butter. However, this past summer my friend Dianne brought us some Adluh grits up from South Carolina. We started making grits to accompany our tempeh bacon and couldn’t stop. Locally we pick up a back of Bob’s Red Mill Corn Grits. I’m not going t post directions because we just follow directions on the bag then add salt, pepper, nutritional yeast and occasionally some Daiya cheese. We also like to just put the slices of tempeh bacon right on top. Lastly, scramble up some tofu and veggies for a nice egg substitute. It strikes me as strange to say substitute or replacement but I’m a former omnivore so my first encounter with dishes was not as a vegan. 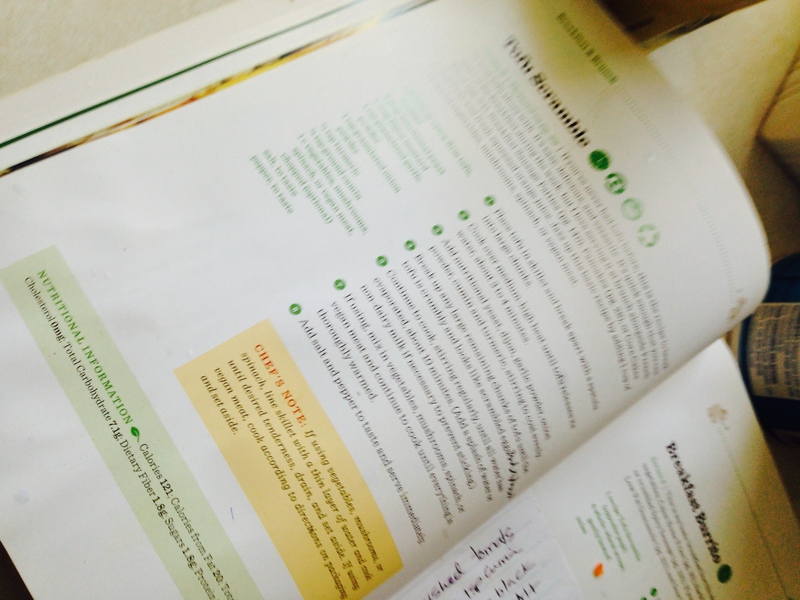 You may not be able to tell but our Happy Herbivore cookbook has seen some meals. This is something my LMS prepares. We don’t have it that often but when we do it is delicious! 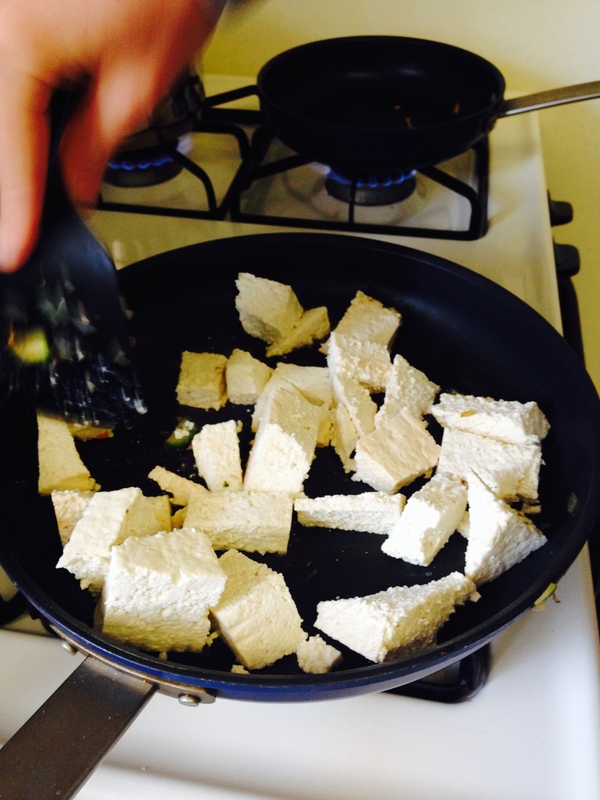 Drain excess water off of tofu and place it in the center of a non-stick or greased skillet.Using a spatula, break tofu up into thick cubes. Cook over medium-high heat for 3-4 minutes, until the tofu release its water. Add remaining ingredients, stirring to combine. Continue to cook and stir for another 5-10 minutes, breaking tofu chunks into smaller pieces so the consistency resembles scrambled eggs. Add a splash of non-dairy milk or lemon juice if the tofu starts to dry out or stick to the skillet. Once the tofu has the right consistency, is yellow in color and is thoroughly warm, add additional salt and pepper to taste and serve. 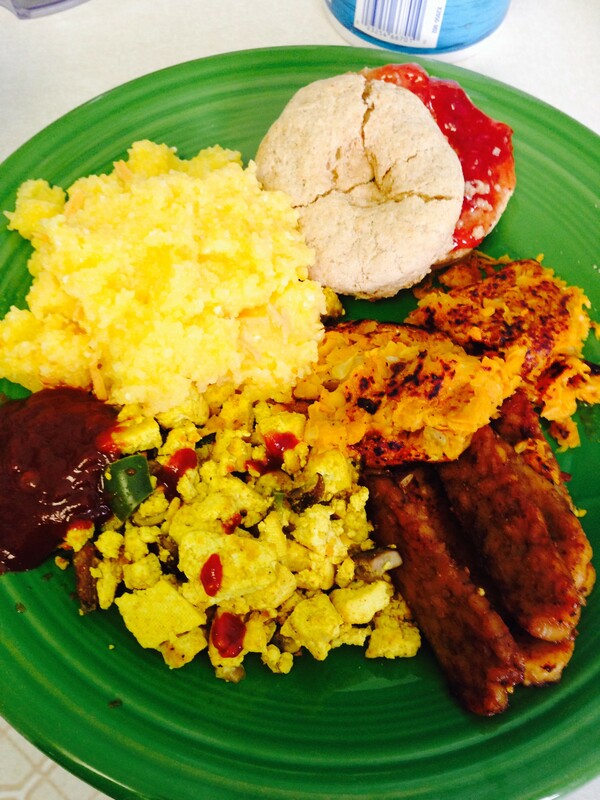 I think this vegan breakfast proves that no matter how you were raised, where you’re from, or where you end up – compassion is possible and anything can be veganized!